I really get annoyed when people assume that all pythons are huge, dangerous, man-eating snakes. First of all, human beings are NOT a snake’s first choice on the reptilian dinner menu. Second, they do not seek us out, they would prefer to hide from us. 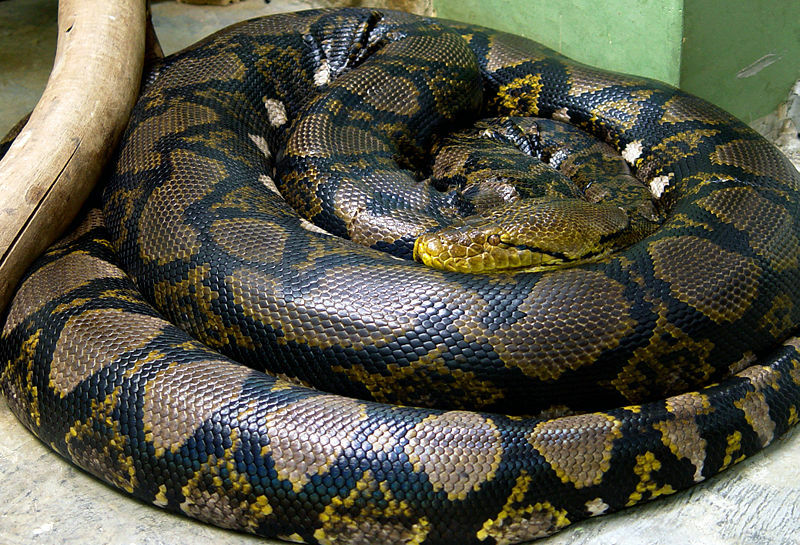 And people……a reticulated python is NOT venomous. Its scientific name is Python reticulatus. Reticulatus is Latin for “net-like” and refers to its pattern. They are the longest snakes, but not the heaviest. The anaconda has that in the bag. They are capable of killing an adult human, but do not attack unless that human is messing with them in their natural habitat, or the human is a dimbulb who got a big snake “cuz it’s KEWL” with NO idea in the world how to handle it. By dimbulb I mean someone who lets their 20-foot retic roam the house, or tries to handle it alone without another, strong adult to help. 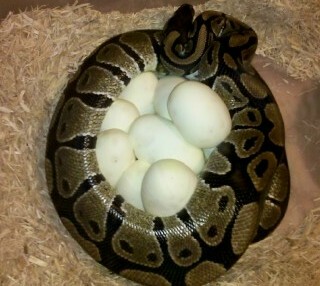 Retics and Burmese pythons are often confused one for the other. 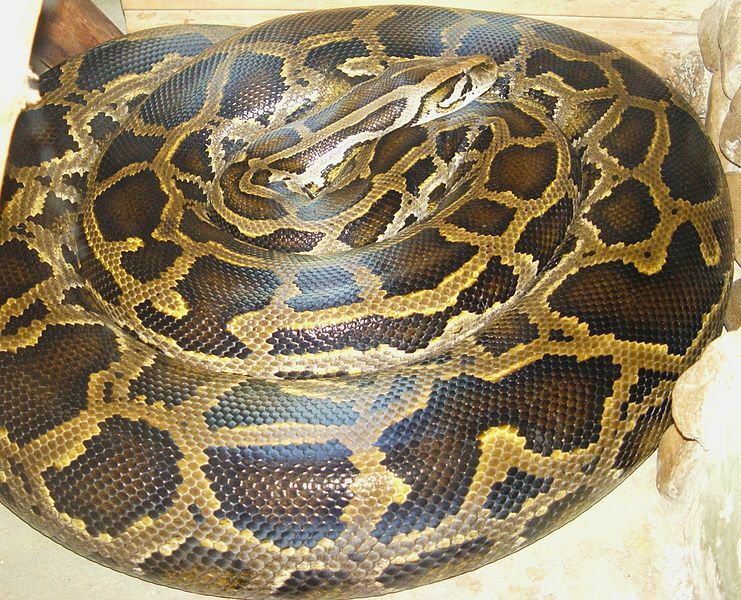 Burms do not usually get as big as retics, but close; averaging 12-19 feet in length. They also reputedly have bad attitudes; I haven’t been around any to know for sure. A ball python (Python regius) or “Royal” python is probably the #1 most popular pet snake, along with the corn snake. 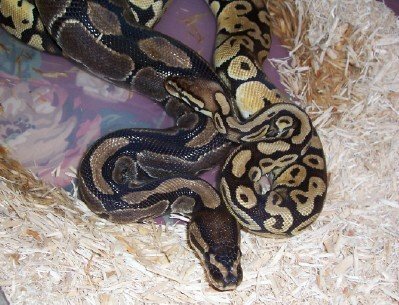 Your average ball python, on a diet of one weaner or small rat a week (depending on the snake’s size), can grow to an average of 3-4 feet long and as far as weight, that’s entirely dependent on how well they eat and how much you feed them. We have a couple of breeding females who are approximately 6 feet long and about 10 lbs. We feed them medium rats (which, in a pet store is sold as a “large” rat). A ball python is not scary, unless their main method of self-defense, curling up in a tight ball, is your idea of “scary”. A lot of them tend to be VERY “bitey” as hatchlings; some morphs seem to be more so than others. Pythons are a fine species of snake and deserve a lot of respect. This entry was posted in Snake Facts and Snake Care. People seriously believe that? One of my first snake memories was holding a friendly Burmese Python at the local zoo. They seriously do. This is one of many reasons large constrictors can’t be shipped across state lines. We tried to fight it, but the ban went through largely based on a bullcrap USGS “study” prompted by the Everglades burm crisis. They failed to understand that these snakes could not spread their numbers all over the country because they literally cannot survive in the wild in anything less than a tropical environment. In other words…..South Florida. Okay, so ban shipments to South Florida. People’s irrational thinking and government b.s. is what puts these things in people’s minds AND hurts the reptile trade.